Figures show that number of female directors has increased by 14 per cent since the start of the recession – but over half of all Irish PLCs have no women sitting on their boards. FIGURES THAT SHOW that more women are taking up company directorships since the start of the recession have been described as “encouraging”. Analysis of company records from Vision-net show that there are now 104, 971 women in director roles in Irish companies. There were 92,281 in those roles in 2008 – and just 48,571 in 2003. That constitutes a hike of 14 per cent in the number of women in director roles since the economic crash. As there are 494,571 directors in Ireland in total, one in five are now women. Most of the female directors are in their 40s and 50s – only 4 per cent are in their 20s – and are more likely to operate in the professional, social and personal services, as well as in the construction sector. In an aside, the most common first name for a female director in Ireland is Mary, followed by Margaret, Anne and Catherine. However, it also emerged yesterday that only 8 per cent of board members in Irish public limited companies are women. 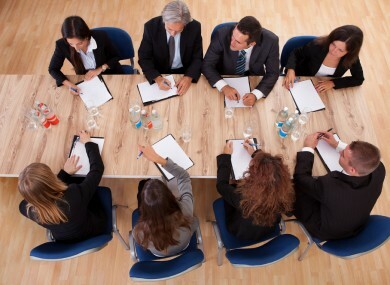 Over half of all PLCs (57 per cent) have no women on their board at all. These figures, compiled by research firm Accreate ahead of today’s International Women’s Day, found that Ireland is “lagging behind” our nearest neighbours, the UK, where 17.3 per cent of all PLC board members are women. In Norway, the figure is 35.9 per cent representation. There had been some good news for businesses in the end of February figures released from company records, which showed that the number of businesses collapsing had slowed down considerably over 12 months. Although 140 businesses had dropped the shutters between 1 and 25 February, this was a 32 per cent decrease on the same period in 2012. Most of the insolvencies had been in Dublin (44 per cent) and Cork and Kildare had 10 per cent and 8 per cent of the cases respectively. On the other side of the coin, 3,418 new companies started up in February – that was up 7 per cent on the same period last year. Something to note though: of these, 2,277 were simply registered business names and 1,141 were the incorporation of new companies. There was less satisfying news, however, in the hospitality and construction sectors – over 66 per cent of businesses in hospitality, and 58 per cent of those in construction, were deemed ‘high risk’. Email “One in five company directors is a woman (and she's most likely to be called Mary)”. Feedback on “One in five company directors is a woman (and she's most likely to be called Mary)”.